Its that time of the year to toss to a Chinese New Year filled with much prosperity, joy and health being! And there’s no better way to do this than to gather with family, friends and loved ones to usher in the Year of the Pig with Yee Sang or Yu Sheng and other festive good eats. Yee Sang is made tastier with Norwegian salmon and fjord trout. 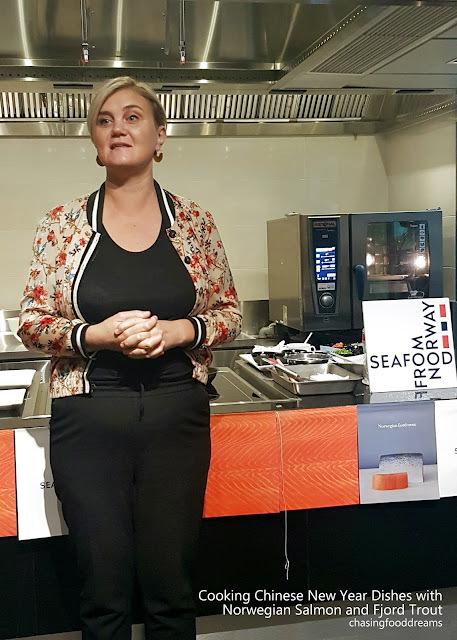 The Norwegian Seafood Council recently hosted a workshop on “Cooking Healthy and Prosperous Chinese New Year Dishes with Norwegian Salmon and Fjord Trout” at KDU University in Shah Alam. Members of media, bloggers and honorary guests were treated to a delectable cooking demonstration by the jovial Chef Jimmy Chok. This is no ordinary workshop but rather an in-depth class of how Norwegian Seafood Council is ensuring diners all over the world that Norwegian Salmon and Fjord Trout is deliciously safe for consumption and how theses fishes are reared and harvested out of the cold, clean waters of Norway and within hours are sent for export to more than 100 countries around the world. The perfect timing of the festive season, Norwegian salmon is now a Malaysian favorite when it comes to Yee Sang. Fjord trout is also another good option for the festive Chinese dish. Norwegian salmon is one of the richest sources of Omega 3 fatty acids and a normal meal of 150g of salmon covers a person’s weekly needs of Omega 3, according to the European Food Safety Authority recommendations. It is also a rich source of iodine, selenium and other key nutrients. The Norwegian Fjord Trout is similar to salmon, but its flesh has a deep red-orange colour with white marbling that gives the fillets a luxurious feel. Norwegian Fjord Trout has a remarkably rich flavour, with a pure aftertaste. It has a lustrous and silvery skin like salmon and grows to a weight of 2.5 kilos, which is a bit smaller than salmon. Chef Chok proceeded to explain that salmon has a layer of rich oils that is release during cooking hence one doesn’t even have to add any oil while cooking the fish. It only takes a few minutes to cook to a perfect doneness with a soft pink doneness in the middle. One should also leave the fish to seared well on the skin side down first and then flip over for another few minutes before the fish is ready to be seasoned or jazzed up with sauces. The fish is so versatile that one can also steam, bake, deep fried, stir fry and pan seared it. Same goes for the fjord trout and both fishes from the waters of Norway are safe for raw sashimi consumption on its own or with yee sang. Steamed baked at low temperature, the fjord trout literally melts-in-the-mouth! Chef Chok, together with Mr Jon Erik Steenslid and Norwegian Ambassador to Malaysia HE Gunn Jorid Roset proceeded to whip up their Yee Sang. There are no limits when it comes to ingredients for a Yee Sang although there are some basic classic ingredients to balance up the dish for its signature savory, sweet and sour notes. Textural components are also essential to making a great Yee Sang. Of course, the Norwegian Salmon is the highlight of the yee sang! We also had the opportunity to make our own yee sang. Our yee sang had plenty of fruits like Mandarin segments, juicy pomelo sacs as well as pomegranate, dried apricots, dried figs, dried berries, pickled ginger and radish, crispy salted egg fish skin and more, all tossed with a kaffir lime leave infused plum sauce and slices of delectable Norwegian Salmon. Our lunch includes Sweet Sour Soup with Norwegian Fjord Trout, Steamed Norwegian Salmon Head with Fermented and Salted Garlic Chilli Sauce, Deep Fried Norwegian Salmon Cubes with Szechuan Pepper Salt, and 41C Norwegian Fjord Trout with Japanese Mushroom Black Pepper Sauce. After the yee sang, Chef Chok serves up a tasty Sweet and Sour Soup with Norwegian Fjord Trout. Taking the classic soup and adding the fjord trout pieces are much welcomed by everyone. The trout is utterly tender and goes well with the richness of the soup. Deep Fried Norwegian Salmon Cubes with Szechuan Pepper Salt takes on simple cooking with basic seasoning, reminding us that as long as the ingredient such as the salmon is fresh and of premium quality, the salmon can really be amazing when its cooked just right. Another great way to enhance the lusciousness of the fjord trout would be to slow baked them at low temperature. The 41C Norwegian Fjord Trout with Japanese Mushroom Black Pepper Sauce had everyone enjoying the creamy and melt-in-the-mouth trout paired with a robust black pepper sauce with mushrooms and iced vegetables. I was particularly fond of the Slow Cooked Norwegian Salmon with Chili Bean Tomato Sauce. A whole fillet of Norwegian Salmon slow baked and sauced up with a rich and piquant sauce that beckons for steamed rice. The dish is perfect for foodies who enjoy Chinese dishes with rich and spicy flavours. 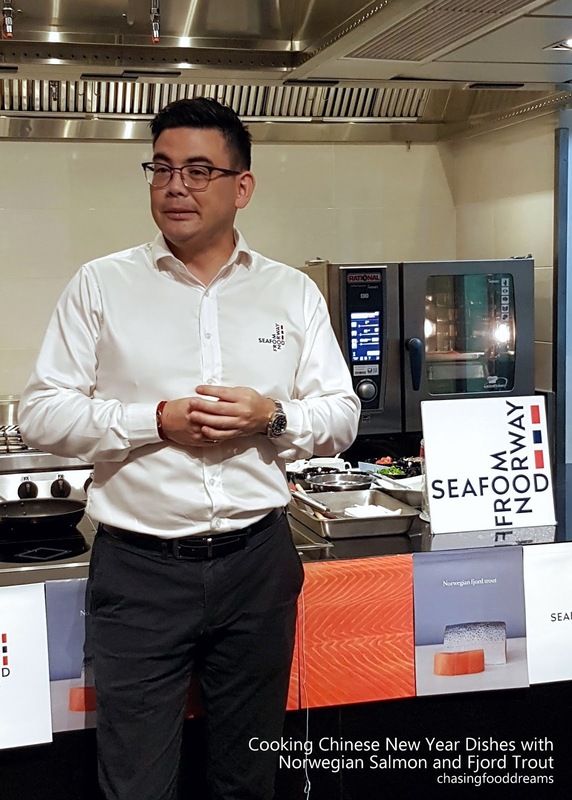 Nothing is ever wasted and one of the recipe to use up Norwegian Salmon head is flagged by Chef Chok in his dish of Steamed Norwegian Salmon Head with Fermented and Salted Garlic Chilli Sauce. Another dish that is bound to be a hit, this dish had a sublime umami flavour from the fermented tauchu, black beans, garlic and other aromatics. The Norwegian Seafood Council (NSC) is owned by the Ministry of Trade, Industry and Fisheries. The Norwegian seafood industry finances its activities through fees levied on all exports of Norwegian seafood. NSC is the approval authority for Norwegian seafood exporters. Arrange all the vegetables, fruits and dried fruits attractively on a large plate. Top with kaffir lime leaf shreds, ginger flower. Pour hot soup over and add chilli oil as needed. Salt trout for 20 minutes and wash away salt after that. Dab dry with paper towels.